Today I'm showing you the third & final lot of cards I made for the ESAD card swap. This one uses the fun All is Bright Suite including the Making Christmas Bright Stamps with fussy cut stockings from the All is Bright Designer Series Paper (DSP), All is Bright paper clips and the Shaded Spruce ribbon from the Metallic Ribbon Combo Pack. 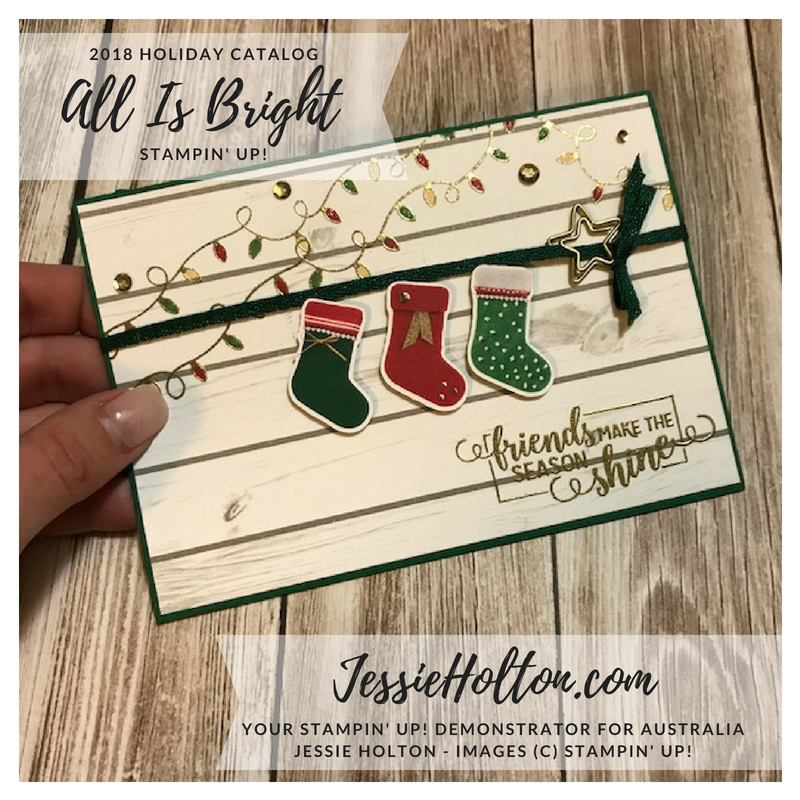 I have also used the wood print paper from the Festive Farmhouse DSP. I have Gold heat embossed the lights & sentiment, then coloured the lights with Stampin' Write Markers in Real Red, Garden Green & So Saffron. Then I've added some sequins from the Metallics Sequin Assortment. 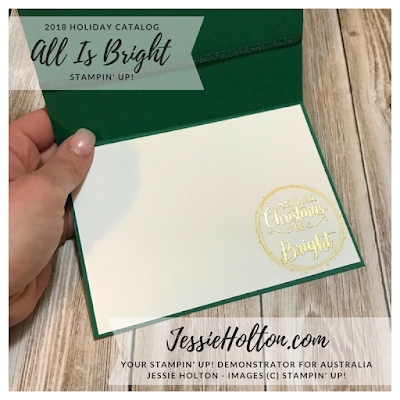 For beautiful heat embossing, lightly rub the Embossing Buddy over the surface before stamping with Versamark & then pour over the heat emboss powder in your choice of colour. Tap the back of the card to remove any excess powder. When using the Heat Tool, give it a minute to heat up & then give a quick blow over the whole piece to remove any excess powder, then hone in on an area. Hold it so the light is reflecting on it & then slowly move along as the powder starts to go smooth & shiny. Be careful not to over heat it or it will start to go uneven again. I also stamped the inside with So Saffron & a bit more Gold heat embossing for the sentiment, on a Whisper White layer.